DIY micro-robotics is having a moment. The latest project to take the crowdfunding route — via Kickstarter — to build out a platform for playing around with robotics is called BrickPi. As its name suggests, BrickPi is a mash-up of the Raspberry Pi microcomputer, co-opted to act as the brains of the robot, plus LEGO Mindstorms sensors, bricks and motors for crafting its working parts. Firmware is written in Arduino, making it open and hackable. Indeed, the BrickPi makers have put their hardware designs and software source code online for download on Github. The BrickPi extends the Raspberry Pi with a board that snaps in place over the Pi to connect it to the various LEGO sensors (such as touch sensors, colour sensors and gyroscope). This is then contained within a plastic case that is compatible with LEGO bricks so it can act as the base for building out the robot. An on board battery connector allows the robot to be untethered from a power socket so it can go roving. 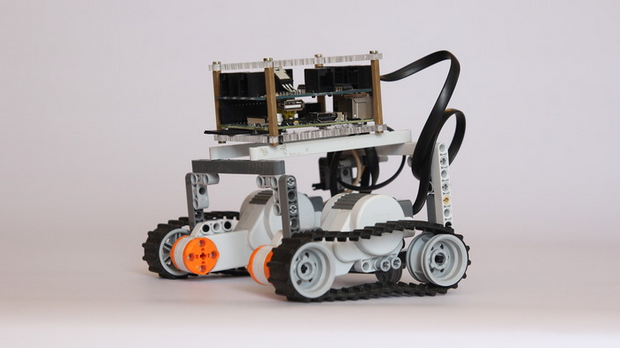 The BrickPi is the brainchild of educational robotics company Dexter Industries which also sells sensors for LEGO Mindstorms. The Kickstarter campaign has five days left to run and is approaching $90,000 in pledged backing from more than 1,270 backers — hugely above the original (modest) goal of $1,889. Going the crowdfunding route sounds like it was primarily about building a community and getting the word out for Brick Pi’s makers but they have added a series of stretch funding goals to explain what they plan to do with the extra money raised. These include adding more sensors and ports to the device and creating additional libraries (in C/C++, as well as the original Python libraries) to expand programming options. The original goal of the funding campaign was to bring the cost of the BrickPi down to $35 — making it the same price as the Raspberry Pi. BrickPi also pledged to write a library for the Scratch programming language, itself developed for helping kids to learn how to code. With projects like this, and mOwayduino — another robotics platform in the making due to go the crowdfunding route shortly — hardware hacking for creatively minded kids has never looked so easy.